We work with individuals offices suites/ complete office buildings/serviced offices and offices within industrial buildings. Not only do we ensure that your front of office areas and public areas such as receptions, present the highest possible standards, but we have developed our services to ensure the communal areas used by staff, such as kitchens, eating areas and toilet facilities are maintained to the highest standard possible. We have created site specific staff training and processes designed for our staff to ensure we manage cleaning customers offices to the high standards, but with minimal disruption even when the services are required during customers working hours. 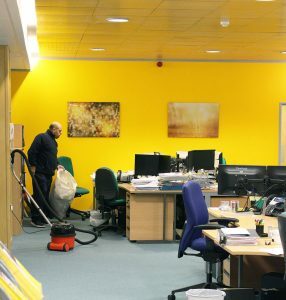 We are happy to provide In Office hours cleaning services if your business requires that.